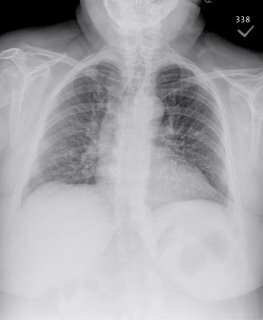 Without dwelling on symptoms, does this CXR look like fibrosis to you? What would you say if her PFT's were entirely normal with that CXR (TLC was 85% and DLCO was 90%)? 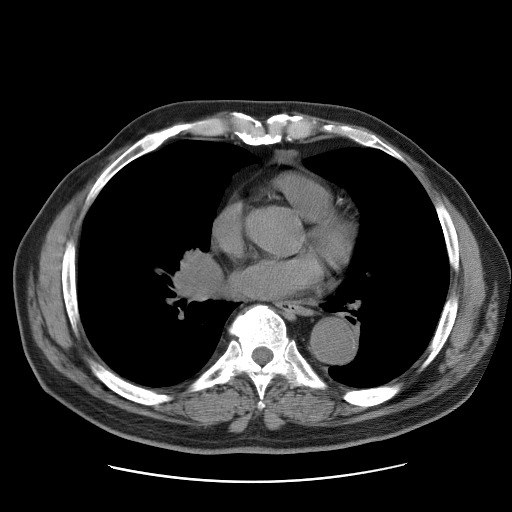 This is a man in his early 40s with an abnormal CT scan: he had presented to the ER with atypical chest pain, had a negative cardiac workup and a CT-angio that ruled out PE but revealed B/L symmetrical hilar and some mediastinal adenopathy (see below). His PMHx is remarkable for psoriatic arthritis and he has been on Enbrel for that. Occasional rare dry cough but no sputum production, no hemoptysis. He smoked for less than a year in high school, no other exposures. His exam is very unremarkable and his arthritis and skin changes are well controlled. His spiro revealed very mild obstruction (FEV1~76% with decreased ratio). What would you do next and what do you think of the adenopathy? Interesting PFT's in an aysmptomatic woman. 77 year old admitted a year ago with pneumonia and referred for lung nodules. He had a PPD placed for unknown reasons in December, (no TB risks/exposures) that is 18 mm induration. He has no respiratory or constitutional symptoms. Is there anyone that would not do a BAL to rule out active TB prior to treating for latent? RLL mass - lobectomy or more workup? 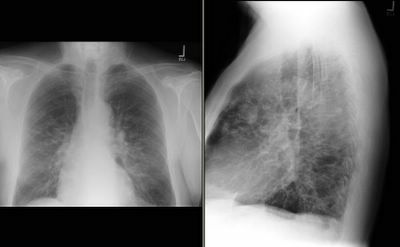 45 year old male smoker w/hx 2ppd for 20 years otherwise healthy with no prior hx of pulmonary disease.or medical history. Suddenly experiences trickling right chest sensation causing gagging coughs bringing up bright red blood with each cough. Persisted for approx 10 min. Would subside and return every 2 hours. E.R. sent home with cough meds and antibiotic w/dx of bronchitis. No cough or blood for 3 days w/bed rest and meds. 4th day cough and blood returned. New E.R. 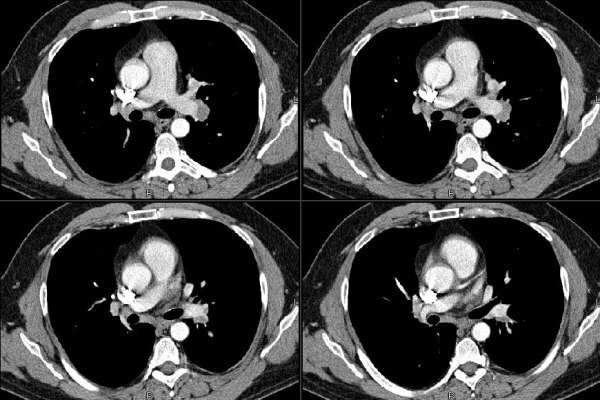 complete workup including CT Chest plain and repeat CT w/contrast which both described ill defined 3cm mass RLL. NO more hemoptysis during hospital stay. Other lab values: Blood Gas ph7.3, PC02 49, 02-68, Saturation 94%BUN 20, Creatine 0.8, Potassium 4.2, PT 10.9, PTT 36.4. CBC-WBC 9300, H&H 15 & 42, Platelet 371,000. LFT's nl. Would you do additional workup or go right to lobectomy? This is a previously healthy 21 y/o woman who works at a local hotel and gets periodic PPDs. She had a negative PPD last year and is a new converter with a new + PPD. She has no respiratory symptoms whatsoever. The health Dept was going to start INH for LTBI but she had a nodule on CxR (outside films, I can't post them) and we got the following CT scan. Do you offer the pneumovax for immunocompetent patients less than age 50 who have asthma? The recommendations do include COPD for the above group, but dont seem to specifically mention asthma. I realize the influenza vaccine should be offered for asthmatic patients, but I wasn't sure about the pneumovax one. For the past 9 months or so, we have been using Propofol alone for sedation for our outPt bronchs. It works great: compared to Versed there is no need for very high doses in chronic Benzo users, it also causes good amnesia and when you are done they wake up very quickly minimizing turn-around time. What regimens have you been using for sedation for bronchs? And as a follow-up question for those who may have used Propofol for that, in TN its administration outside of the ICU is limited to use by physicians or CRNAs. Have you encountered any limitations to use of Propofol for conscious sedation? 79 year old no respiratory symtpoms. CT from August 2004 showed some hilar and paratracheal nodes. They have been followed. 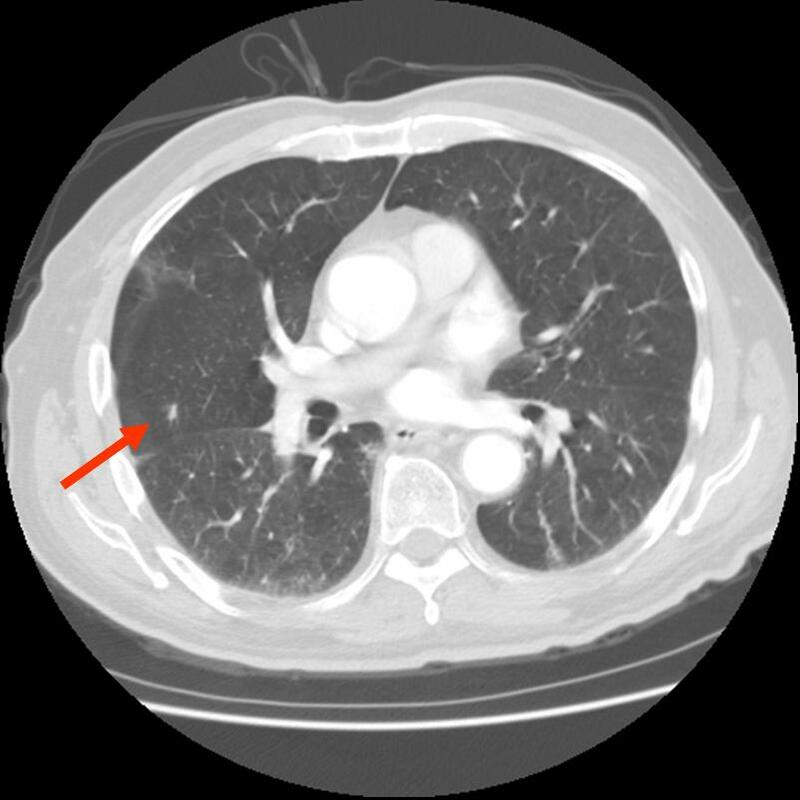 Abnormal anterior mediastinal soft tissue and enlarged right paratracheal, AP window, and bilateral hilar lymph nodes are unchanged from June 2005. Some of the lymph nodes have enlarged since August 2004, although the right paratracheal lymph nodes and hilar lymph nodes are stable. The anterior mediastinal soft tissue is new since 26 August 2004. Multiple bilateral tiny lung opacities are unchanged from August 2004. 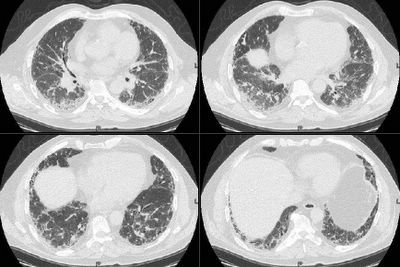 However, an 8 mm lesion adjacent to the anterior segment bronchus of the right upper lobe on image 45/133 has enlarged since August 2004. Would anyone proceed to tissue biopsy in this 79 year old asymptomatic man, or just keep following, even though some of the nodes have enlarged? Patient post - 23 year old woman. I have been diagnosed this past year with heterozygous factor V Leiden. I have a diagnosis since 12 of asthma, which is treated with Advair 500/50, singulair combivent every 8 hours as needed, albuterol inhaler and nebulizer solution to use every 4-6 hours as needed. I hardly use either. In January of 2005, I was drinking some hot chocolate and I aspirated on it, which caused an instant response of coughing (obviously), but I started to cough up bright red blood. This turned into a LOT of bright red blood, no sputum. I ended up coughing up about 100mL of blood or more - I never measured it. I was brought to the ER, where I had an x-ray taken, and a laryngoscopy (sp? ), I coughed up another 10-15ml of blood while there. I was told that I probably burst a blood vessel in my lung and I was sent home. The next day, I coughed up a long, dark red-black clot of tissue and blood, then I began coughing up blood again, another 15-20mL. It stopped, I did not return to the hospital, as I was told I would continue. The next day, the same thing happened, except less, maybe 10mL of blood. I didn't think anything of it until the next month, toward the end of February while I was shopping with my mother, and I got into the car and suddenly the hemoptysis began again, for no reason. I had not coughed, I just felt a small rumble in my chest and the need to cough the liquid up. Once again, there was bright red blood. My mother took me to the ER, there was less blood this time, and they did a D-dimer, which came back abnormal. In the time I was waiting for the result for the d-Dimer, they did a chest x-ray, which showed nothing significant. Afterward, they did a V/Q scan with both the IV and the nebulizer of the tracer dye. It too was inconclusive. So they sent me to CT to get a scan with dye. That was inconclusive as well. I was admitted to the hospital, and they sent me to get an angiogram. Finally, they found a small clot in my lower left lobe. I was started on heparin, and kept in the hospital for 4-5 days, I don't remember exactly. On the last day, they started me on Lovenox and warfarin, and then they sent me home. This was a friday, I was told to be on bedrest, I also had not moved. The morning after I had been admitted, they had done a doppler ultrasound (duplex) of my legs, and found no clots in my legs. Apparently, there was an "artifact" from the CT or the angio that they saw in my pelvis, but it was a motion artifact, so they didn't see it clearly. Anyway, on Monday, after only four days combined warfarin/Lovenox therapy, my INR was tested, and it was 2.8, so the nurse told me to stop the Lovenox. I did, and the next day I felt pain in my right shoulder blade area that radiated into my ribcage eventually. I called my doctor's office and they told me to call 911. I did, was taken to the ER, my INR was 2.4. Another CT with dye was taken, and this time I had a clot in each lobe of my right lung, along with pulmonary infarct. Each time this happened, my O2 sats were 100 or 99. I was admitted, put back on heparin, and tested for clotting disorders, told I had anticoagulation failure, and had a permanent greenfield filter placed in my inferior vena cava, right above my pelvic veins. I coughed up blood a few days into this one as well. Although I was not told at the time, apparently there was a nodule that was noticed in the CT scan. I will bring this up momentarily. I decided I didn't trust these doctors, especially after they put me on both warfarin and Lovenox indefinitely. After 7 days of Lovenox at 140mg 2x day S/Q (I weighed 330lbs or so at the time), I began to have "massive hemoptysis" (their words - it was around 100mL - nothing I hadn't done before). This was on March 12, my birthday. I was again in the car, and at the time I had pneumonia, which I had taken home from the hospital with me. I had been on a dose of a z-pak, as well as some other anti-biotic, but I don't recall what it was. Anyway, I went to a different hospital, where they admitted me and again a CT was done with dye, the same clots were seen. They, too, saw the granuloma (calcified) in my lung, the right side, and again, it wasn't mentioned. My anti factor Xa levels were extremely high, so the Lovenox was discontinued. I was hospitalized for 12 days, as my INR stabilized for the FIRST TIME. I coughed up blood a few more times over the next couple of days after the first day I was there, as it seemed I would always do after a first episode, once again coughing up a big clot of blood and then bright red fresh blood before stopping. I would eat cough drops and drink cough syrup. After my release, I was once again told I would remain on warfarin, basically, for life, due not only to my filter, but to my previous PE and my FVL diagnosis. I didn't cough up anymore blood until my INR was around 2.7, in June, because I was concerned that it tended to hover around 1.8-2.2, and I was afraid of another clot. Then they raised my dose another 2.5mg per week. I was taking a total of 65mg a week. At the end of July, I had another episode of hemoptysis, only around 50ml, I went to the ER, they did a CT scan with dye, told me I had bronchitis, sent me home with antibiotics. Again it happened in August, they listened to my lungs, said I had bronchitis, sent me home, same amount of blood. Again at the end of October, they did an x-ray, sent me home. Each time, it was around the same amount of blood. Each time, there was no coughing prior to it. Nothing to make it seem like I had a cold. My INR was not too high, it was always in range. I was also getting non-injection dye CT scans to follow the granuloma by my pulmonologist, and so far, it has remained stable. It's classified as a "nodule", pretty small, I've had it recently suggested that it may be a harmatoma. Whatever it is, it's half calcified. I did not cough up blood at all during November or December, and for most of January. Then, last Tuesday, I began actually coughing, as I've had a cold since the beginning of November (go figure), and I coughed pretty hard, and immediately began feeling the rumble of blood in my lungs. I begain coughing up bright red blood, rather violently a few times, as though I couldn't quite get it out. My pulmonologist told me that the next time I did this, I was to go to the ER and demand a bronchoscopy, so that's exactly what I did. Except when I got to the ER, they admitted me, I did measure how much I coughed up, it was 100mL of blood. They got me in a room, and scheduled a bronch for the next afternoon, and my INR that evening was 1.7. The next morning it was 1.8. They wanted it closer to 1, so they insisted on giving me FFP, three units, which I turned out to have an allergic reaction to at the last minute of the last bag, or it may have been the vitamin K shot they gave me, either way, my INR was only 1.4 when they checked it again. And I had a shot of 50mg of benedryl. And the bronch was canceled. The pulmonologist on duty wanted to instead do an arterial angiogram to see if I had a harmatoma with bleeding vessels that was causing me to cough up blood and to see if she could embolize them. But the other docs vetoed her, so nothing happened that day. The next day, again a bronch was scheduled, and my INR was still 1.4, but they did the bronch anyway because I refused additional FFP because of the allergic reaction. The bronch showed nothing. The day before I coughed up an additional 50mL of blood. They decided to take me off the warfarin, saying it was too dangerous for me to be on it. They think it is the warfarin causing me to cough up blood all the time. I have many questions, some of them may be able to be answered by pulmonologists, some of them not. Is it more likely that I have a harmatoma or a granuloma? Is it likely that the nodule is the cause of my hemoptysis or the warfarin? Could an INR of 1.7 cause me to cough up /that/ much blood? Could being off of warfarin for a month put me at increased risk of pulmonary embolism? Is all this hemoptysis ruining my lungs? What is wrong with my lungs? I know that without actually seeing me, reviewing my records in depth, seeing my scans, x-rays, etc, it's very hard to know the answers, I just want to know what other people think, since I've been seeing the same doctors for a year now, and nobody knows what the heck is wrong with me. I'm at my wits' end. And I'm terrified. I'm a 32 year-old man, having Minimal bronchiectatic changes since the childwood, I've undergone several types of medicines prescribed by several doctors though out my life. 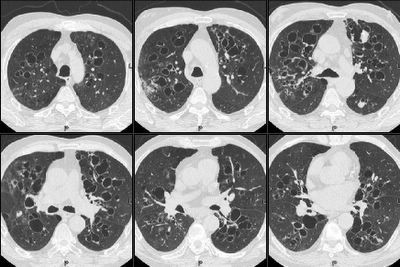 Impression: CT Findings suggest minimal bronchiectatic changes involving apical segments of lower lobes, basal segments of left lower lobe, lateral basal segment of right lower lobe and apico-posterior segment of left upper lobe. Tiova inhaler - ((Generic Spiriva) daily 2 dose. Salbutomol - 100 - 2 times a day - 2 dose. whenever I get lungs infection - antibiotic tablets for 5 days. Daily minimum sputum will come out. If lungs infection has happened due to outside dust polution & cold - sputum will be more & fever. usually I get lungs infection in 1 1/2 months - 2 months of times. also I take higher antibiotic tablet is infection resist to current auntibiotic tablet. Is there is any way to get rid of this problem and can live as normal human being? I can't eat/drink cold items, can't spending in warm water, etc..
it will be greatful if you suggest for any permanent solution for this, so that I can get cure and lead the life with peace. 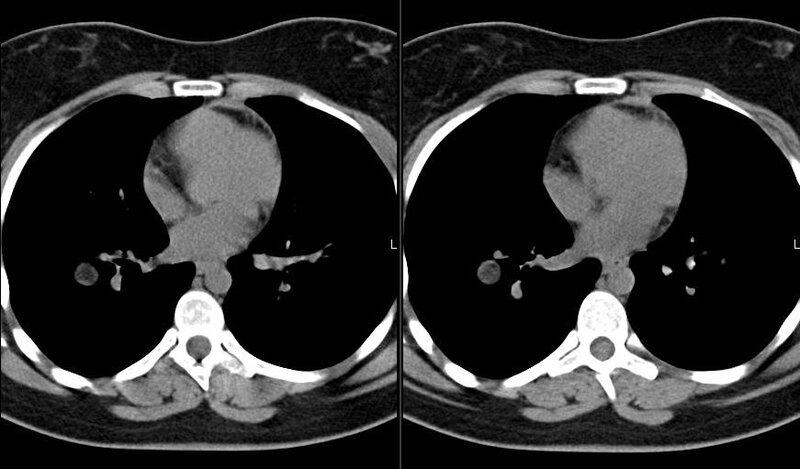 I had posted on this 70 y/o woman back in October with CT results early in November. She had the proximal lesion with complete L lung collapse. 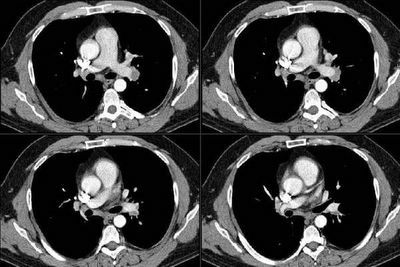 She was seen by our thoracic surgeons and by the chair of CT surgery at a nearby University Hospital and they all felt with the proximal lesion, low PFTs and prolonged lung collapse that she was not a surgical candidate. We then proceeded with Chemo/xRt and APC (argon plasma coagulation) to the lesion via bronch. She had some improvement: on a repeat bronch her airways were more patent to the left and a f/up PET post Tx showed good remission. The CT part of the PET showed some re-expansion of the lung with a larger effusion. We brought her in for a thoracentesis, got ~1.5 L of clear yellow fluid and the post-tap CxR below on the L. I placed a CT and got the Cxr on the R.
It seems she has trapped lung because of the persistent collapse. The fluid was negative for malignancy and the collapse was due to intrinsic obstruction which is improved. Would you try and offer anything else? A 70 year old has had about 15 years of (stable) arthralgias in the knees, feet and DIPs. 5 years ago a routine CXR suggested some scarring. Dyspnea on exertion with a flight occurred about a year ago. 5 mos ago it's a bit more progressive subjectively (but still a flight of stairs) and with a non productive cough. No fever/chills or other constitutional sx. His spiro 2 mos ago shos a TLC of 61%. Spiro today shos FVC 60%. An RF factor was 83 (<15). An HRCT showed some honeycombing at the bases and thickened septal lines elsewhere with some gnd glass; basically seemed to have NSIP appearance. His joint symtpoms have been stable but he still has am stiffness and takes motrin. Question: this seems like rheumatoid lung to me. Would you treat the rheumatoid and follow, or continue with an official ILD workup? In other words, is there any reason to go with a bronchoscopy and maybe an open lung prior to empiric therapy for rheumatoid? Would any one give him prednisone and methotrexate and just follow? This is a case from late October but I still like it because of the pictures. This was the 65 y/o man with CHF (EF~25-30%) with 6 weeks of daily fevers with arthralgias who had been admitted twice with multiple negative Cxs and no diagnosis yet. He had the Janeway lesions on palms and soles and we treated him for culture-negative endocarditis/endovascular infection. He was just re-admitted with syncope (likely related to his BP meds) and hisskin lesions haave completely resolved. His ESR has come down from 115 to 30 and he has been afebrile for weeks with no recurrence. All of his cultures and serologies were non-diagnotic. The patient has some fluid-filled cystic spaces in the retro-sternal and retro-cardiac areas with the interstitial changes outlined by Jennings. This is one of our regular patients in his 60's with chronic cough and dyspnea. What do you think of the CxR? I had seen this 76 y/o man about 18 months ago for "abnormal CxR". 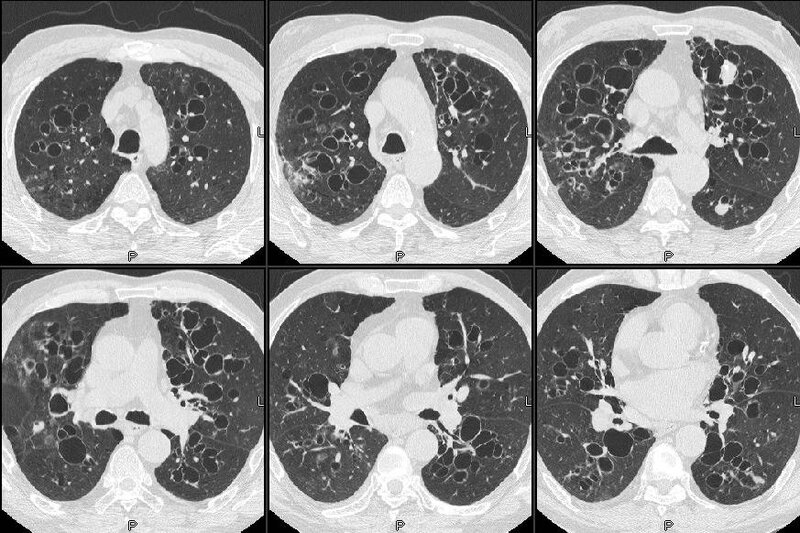 He had "dry" crackles, a mild restrictive defect (FVC, FEV1 and TLC all around 70%) and a HRCT very typical for IPF. I had discussed prognosis and treatment options and suggested a referral to the nearby University center for possible enrollment in a trial. He felt fine and declined the referral. He continued to see his PCP but had cancelled his follow-up with me. 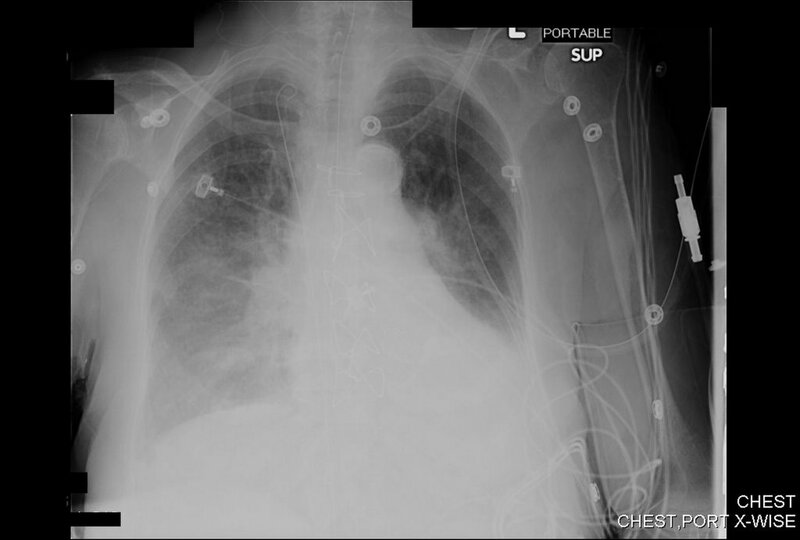 He then came back because of worsening dyspnea and hypoxemia (he is now on 3L/min O2) and his FVC is down to 45%. I have attached a recent CT image below. He is obviously not a transplant candidate and he does not want to enroll in clinical trials. What medical therapy (if any) would you offer him? This is the young guy with back pain and bacteremia. He grew MRSA on half of his blood Cxs, his 2-D-Echo was quite unremarkable but he had a large (T1-T12) epidural abscess... 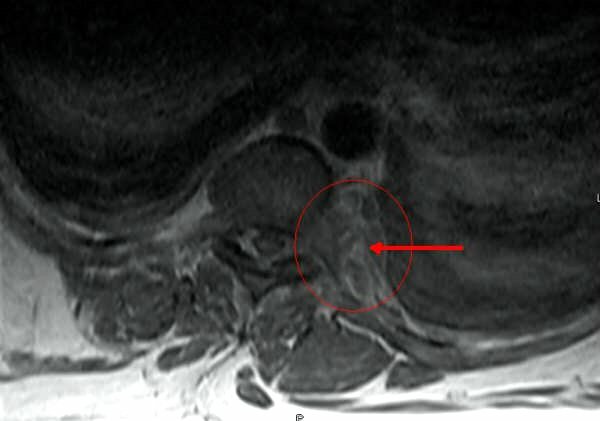 The image circled on the MRI in the original post actually shows a small posterior pleural abscess. He was started on vanco and rifampin. Would you do anything else or any further comments? A 64 year old woman had a screening CXR because of previous smoking history leading to a CT showing upper lobe central bronchovascular densities with a bit of ground glass. She is entirely asymptomatic and has no medical probs. She is obese, but exercises 3 x a week. Question: would you work this up or discharge her from the clinic with f/u if symptoms develop? BTW her spiro shows obstructive ratio with FEV1 85% predicted. I am a pediatrician in a very small town in Northeast Louisiana and have a case which has me at a loss. The pt is a 12 yr. old male with a history of RAD since having RSV at 5mos of age. He also has a history of partial seizures for which he is being followed by a pediatric neurologist. His last seizure was in 5/04. There are a few other CNS problems/symptoms in his history and will be glad to describe in more detail if anyone feels they may be relevant. To me, it is important to note that he has had no CNS symptoms reported for >1 year. He has been brought in to my office by his mother, a nurse, twice within the last year complaining of leg weakness, intermittent nausea, and occasional H/A. The mother brought him in fasting because the father had hypoglycemia so she wanted a FBS on the pt. Both times I complied and both times, they were found to be normal (91 and 100 respectively). I ordered a CBC and the WBCs were found to be a little low (5-6,000) compared to his norm of 8,000 with slightly increased lymphocytes. He also had a slightly decrease platelet count of 113,000, but still within NL. I told the mother he presently appeared to have a viral infection, but with no fever, or other S&S I'd just leave him alone. I also told her the leg weakness, etc. may or may not be related to the presumed virus, so if it persisted, bring him back and I'd check an ESR and CRP. 4-6 months after his last visit, he returned to me because his brother (8 yrs) had recently been diagnosed with H-Pylori and since the mother mentioned that THIS patient had still had nausea, I suggested we test him as well. The mother reported that the leg weakness still occurred occasionally, it was a little less frequent. Upon auscultation of his chest, I found it sounded clear, however, he didn't sound like he was moving enough air as he should be. I ordered a CXR which showed consolidation in both lobes. I could not explain how he could have no fever or cough, but there it was, in black and white! Since he also had C-Diff a little over a year ago, we are still trying not to use oral antibiotics (for as long as we can, at least) so I ordered a Bicillin CR 1.2 mu-IM, Xopenex 0.63 q6h, and pulmocort 0.5 mg bid via neb for two weeks. I noticed on the Xray, that there were small "nodules" in his hilar region, with a larger one in the Left lower lobe. I sent the Xray to a radiologist which reads film for the clinic I work for. The report said these were calcified granulomas. With the pts history of RAD and recurrent bronchitis, I figured it was just "old junk." When he returned for his two week follow up, I repeated the CXR and after the nebs, etc., and there still appeared to be some bronchitis in his films. Still no cough, no real symptoms. I sent him the next day to a local Asthma, Allergy, and Immunology specialist. He felt the "pneumonia/bronchitis" I was seeing was probably atelectasis due to his asthma. He wasn't sure about the granulomas, but decided he would change him to Advair 250 bid and 10 days of Prednisone 40mg bid x 2wks, then repeat the CXR at the hospital in 1 month. This time, the hospital radiology report stated that there was one granuloma in the left lower lobe, and several hilar/mediastinal calcified lymph nodes. The asthma allergy specialist felt it was probably histoplasmosis, but I wasn't convinced. I didn't feel he met criteria for histo, and I've been very involved in the care of this patient for 8 years. I chose to send him out of town to a pediatric pulmonologist. I've known this doctor for 10 years and feel he is very good with things, that may not be clear cut. The pulmonologist felt it was one of 5 things: histoplasmosis, sarcoidosis, coccidio-mycosis, LTBI, or lymphoma. He ordered a CT of the chest, Histo titers, ACE, Coccidio titers, and a TBST (PPD) with Candida control. The CT showed a left ghon complex, and ALL other tests were completely negative or normal... with the exception that both the TBST AND the control were BOTH also negative. The mother called the pulmonologist the day the skin tests were read stating that he appeared to be anergic and wanted him to have quantitative immune globulin studies with subclasses. They were ALL normal, so the pulmonologist felt everything had been ruled out except Sarcoid because it can't be definitively ruled out without a biopsy (but, he's seen an ophthalmologist and no lesions were present and a normal ACE would at least lead you away from sarcoid). The TBST was inconclusive due to anergy. That really only left LTBI and lymphoma according to the pulmonologist. The pulmonologist then, sent the pt to a pediatric surgeon to look at the lymph nodes and attempt to get the granuloma as well. He wanted to perform a thorascopic procedure, collapse the left lung, resect a few of the lymph nodes and it would require a chest tube and 3-4 days in the hospital. The pt's mother heard the procedure described and felt with a ghon complex, there may be a good chance it was LTBI, and preferred to explore all avenues before putting the child through such an invasive procedure. I must admit, I agreed. I ordered a repeat TBST with Candida control just shy of three weeks after the first. Both were negative this time, as well. I spoke with a pediatric infectious disease specialist who said sometimes it takes a lot of PPD to get a reaction if the infection is old. She suggested the new Quantiferon TB-Gold test, but according to the CDC, no one in this state performs it. As of now, our plan is to repeat the CT three months from the first. The surgeon had a point when he agreed to the mom wanting to wait. He said "If it's lymphoma, it'll grow." I am to the point where I either need to tell the mother that the biopsy is now necessary, or do what I've been considering and refer him to Arkansas Children's Hospital. They have Surgery, pulmonology, tuberculosis, infectious disease, and oncology departments. I suppose I would start with infectious disease, but really don't know! I do NOT want to go in the wrong direction here, but cannot think of any other preliminary tests which I can do to help narrow things down further. We only want a biopsy, if we are certain that he doesn't have anything infectious. I would greatly appreciate any ideas/suggestions or insights into this case. This 80 year old with good lung function underwent bronchoscopy. The station 7 node was negative for malignancy (with adequate lymphocyte sampling), and the hilar biopsy was non-diagnostic (respiratory epithelium). How would you proceed next? We were asked to see this 35 y/o man with back pain, paraparesis and fever. He is not a very healthy 35 y/o: long-term DM, obesity (weight fluctuates 315-350 lbs. ), B/L ankle OA and a previous R great toe amputation because of PVD... He came to the hospital with high fevers (104) and back pain with B/L lower ext paresis. His MRI of the spine showed a lumbar disk herniation and a thoracic paraspinal inflammatory process (see below). Blood Cxs are + for Staph aureus. What would you do next and how would you manage him? Traditionally, treatment of acute PE involved IV heparin with coumadin bridging, and d/c after therapeutic INR. Does anyone treat inpatients on day 1 with low molecular weight (weight-based) and then discharge them right away with f/u in coumadin clinic? I realize the studies supporting this relate more to DVT's, but isn't the extrapolation to PE's a valid one?